Our scientists share new research at next week's American Geophysical Union (AGU) Fall Meeting in Washington D.C. (Walter E. Washington Convention Center). CSD submitted nearly fourty total presentations to the AGU Atmospheric Sciences Section. Sixteen posters will be presented in addition to the oral presentations and highllighted talks, all outlined below. Search the AGU 2018 Fall Meeting Scientific Program for abstracts and session information. Download the CSD Oral and Poster Presentations quick reference for AGU. Kara Lamb: Do Surface Kinetics Play a Role in Depositional Ice Growth in Cirrus Clouds? Drew Rollins presents "Aircraft observations of volcanic plumes in the troposphere and stratosphere" at 9:21, as part of the AGU session Understanding the Effects of Volcanic Eruptions: From Plume Evolution to Climate and Societal Impacts I, 150A. Antara Banerjee discusses "Stratospheric water vapor: an important climate feedback" at 16:45, as part of the AGU session Climate Sensitivity and Feedbacks: Advances and New Paradigms II, 146B. Pengfei Yu discusses "PyroCb Smoke Rises and Persists in the Global Stratosphere: Constraints on injected smoke mass, black carbon abundance, and ozone reaction rates with organic coatings" at 17:46, as part of the AGU session Extreme Wildfires and Smoke Plumes: Past, Present, and Future II, 144A-C.
Karen Rosenlof is the Primary Convener and Chair for Session A31A: Atmospheric Trace Species in the Stratosphere: Distribution, Trends, Variability, and Processes Related to Stratospheric Ozone and Climate I, 8:00-10:00, 151B. David Fahey presents "The 2018 UNEP/WMO Assessment of Ozone Depletion: An Update (Highlighted)" at 8:00. Sean Davis discusses "On the robustness of recent lower stratospheric ozone trends in specified dynamics model simulations" at 8:48. Greg Frost is the Primary Convener and Chair for Session A31B: Improving the Science of Emissions Through Inventories, Observations, and Models I, 8:00-10:00, 151A. Claire Granier discusses "Evolution of surface emissions in China and impact on changes in air quality" at 9:00. 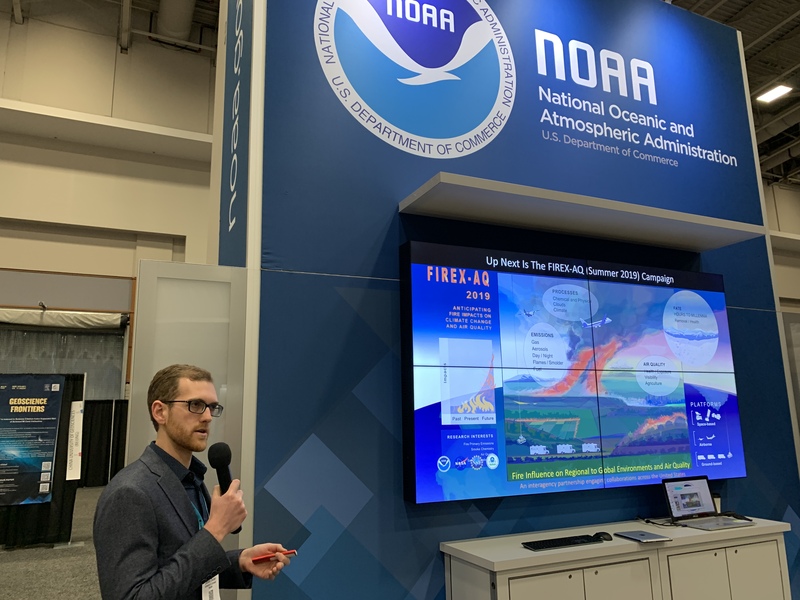 Zach Decker presents "Trace gas measurements in the troposphere and plans for nighttime wildfire plume aircraft measurements" at 10:30 in the NOAA booth, #1415 in the Exhibit Hall. Jessica Gilman presents "Volatile organic compounds in New York City: source signature of emissions from volatile chemical products, combustion, and fossil fuels in spring and summer 2018" at 11:50, as part of the AGU session Urban and Regional Air Quality: Emissions, Land Surface Forcing, and Meteorological Impacts II, 144A-C.
Matt Coggon discusses "Significant anthropogenic monoterpene emissions from fragrances and other consumer products in New York City." at 12:05, as part of the AGU session Urban and Regional Air Quality: Emissions, Land Surface Forcing, and Meteorological Impacts II, 144A-C.
Greg Frost is the Primary Convener and Chair for Session A32B: Improving the Science of Emissions Through Inventories, Observations, and Models II, 10:20-12:20, 151A. Brian McDonald discusses "Evaluating a Bottom-up Inventory of Volatile Chemical Products and Mobile Source Emissions with Field Measurements in New York City (Highlighted)" at 12:05. Karen Rosenlof is the Primary Convener for Session A32A: Atmospheric Trace Species in the Stratosphere: Distribution, Trends, Variability, and Processes Related to Stratospheric Ozone and Climate II, 10:20-12:20, 151B. Steve Brown presents "First in-situ observations of N2O5 and ClNO2 in the upper atmosphere: Results from ATom" at 14:10, as part of the AGU session Atmospheric Trace Species Profiles from Long-Term and Campaign Sampling: Observations from Ground, Balloons, and Aircraft II, 151B. Chelsea Thompson discusses "Distributions and Chemistry of NOx in the Remote Troposphere and the Validity of the Photo-stationary State Approximation" at 14:25, as part of the AGU session Atmospheric Trace Species Profiles from Long-Term and Campaign Sampling: Observations from Ground, Balloons, and Aircraft II, 151B. Joost de Gouw presents "Summary of Results from the NOAA Shale Oil and Natural Gas Nexus (SONGNEX) Study" at 14:25, as part of the AGU session Emissions of Atmospheric Pollutants from Oil, Gas, and Coal Operations I, 151A. Nick Davis presents "Reconciling Hadley Cell Expansion Trend Estimates in Reanalyses" at 8:15, as part of the AGU session The Dynamics of the Large-Scale Atmospheric Circulation in Present and Future Climates: Jet Streams, Storm Tracks, Stationary Waves, and Monsoons I, 144A-C.
Karl Froyd discusses "Mineral dust abundance and sources in the global free troposphere" at 8:45, as part of the AGU session Multisensor, Model, and Measurement Synergy: Aerosol Sources and Their Environmental Effects I, 151A. Jim Roberts discusses "Cyanogen Halides (X-CN, X = Cl, Br, I) could be significant contributors to reactive halogen chemistry in the troposphere." at 8:45, as part of the AGU session Halogens in the Earth System I, Liberty I-K.
Carrie Womack presents "Wintertime ammonium nitrate aerosol pollution in urban areas: NOx and VOC control as mitigation strategies" at 11:20, as part of the AGU session Atmospheric Chemistry in Highly Polluted Environments II, 151B. Jan Kazil is the Primary Convener and Chair for Session A43A: Boundary Layer Clouds and Atmosphere, Biosphere, Land, and Ocean Interactions II, 13:40-15:40, 152B. Graham Feingold discusses "The evolution of cloud field properties in shallow continental convective clouds" at 13:40. Ru-Shan Gao discusses "The Nighttime Fire Observations eXperiment (NightFOX) - UAS wildfire measurements for air quality, fire weather forecasting, and satellite validations" at 14:55, as part of the AGU session Use of Unmanned Aircraft Systems (UAS) in Atmospheric Science I, 152A. Joe Katich discusses "Seasonal Variation of Refractory Black Carbon Loadings over the Remote Atlantic Observed During the Atmospheric Tomography (ATom) Mission" at 14:55, as part of the AGU session Quantifying and Reducing the Uncertainties in the Global and Regional Aerosol Forcing of Climate I, 151A. Megan Bela presents "Emissions, Transport, and Chemistry of Smoke from the October 2017 Northern California Fires" at 16:00, as part of the AGU session The Role of Fire in the Earth System: Understanding Drivers, Feedbacks, and Interactions with the Land, Atmosphere, and Society II, Salon C.
Greg Frost discusses "Characterizing Tropospheric Trace Gas Retrievals from the Cross-track Infrared Sounder" at 17:15, as part of the AGU session JPSS: Providing Advanced Global Observations to Improve Knowledge and Decisions by a Global Interconnected Community I, 206. Greg Schill discusses "The Ubiquity of Biomass Burning Particles in the Remote Troposphere" at 10:35, as part of the AGU session Atmospheric Aerosol Processes Across Scales II, 151A. Agnieszka Kupc presents "New particle formation and growth to CCN sizes over the remote tropical Pacific and Atlantic Oceans. ATom observations and modeling studies" at 14:25, as part of the AGU session Atmospheric Aerosol Processes Across Scales III, 151A.